Enter into the heart of someone you admire by gifting this Exquisite Heart of Love Gift Set that wonderfully paves a way for you. This Gift Arrangement contains Imported Silk/Art. 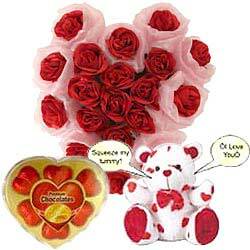 Heart Shaped Arrangement of 19 Red Roses, a I Love You Singing Teddy Bear and a Heart Shaped Chocolate Box. You can wash the Flowers.